Medical engineer, Ryan Stone (Sandra Bullock) and veteran astronaut, Matt Kowalski (George Clooney), are the sole survivors after a catastrophe in space. Alone in the void, with no shuttle and no viable contact with Earth, they must fight to survive or face the very real risk that they might not make it home. Houston, Do You Have A Problem Choosing Films? Click Here For Some Recommendations! I love this film and have watched it four times now (twice during my 500 Days Of Film Challenge!). When director, Alfonso Cuaron, first started working on the story for his Oscar-winning film, Gravity, he had a theme - adversity. And I couldn’t think of a better word to sum up the finished product. Ryan Stone certainly has it all thrown at her as she and Matt battle to survive in the most hostile of locations. And Cuaron makes us feel as if we are right up there with them both. I have to remind myself to breathe every time I watch Gravity! The film also makes me feel dizzy as everything rotates - there is no up and no down here - and claustrophobic whether Ryan is inside a small space module or within the confines of her space suit. At no stage during the film (and I think that this applies whether you see Gravity in 2D or 3D) do you feel that the characters are anywhere but in space. Now, of course, I have never actually been in space but every shot in this film feels natural - it feels real. Gravity is both stunning and terrifying. The technology necessary to achieve what Cuaron wanted to do just did not exist at the start of this project. Indeed, he was told that it couldn’t be done. As a result, It is a credit to all the talented artists involved with this film that they created what they needed and made such an immersive and naturalistic film. However, according to Cuaron, technological developments were never the driving force behind the film. The story was the primary focus and needed to be - otherwise audiences just wouldn't care about the fate of the characters. The story of Gravity is a simple one - Ryan has to choose whether to embrace life and fight to survive or let the tragedy in her past drown her. Some critics have complained that the film’s plot isn’t complex enough but I disagree. I find the film moving and am completely gripped by Ryan’s journey. Sandra Bullock’s performance (and all that she went through to deliver it) is superb. When you see how they shot Gravity and melded technology with machinery and actors you wonder how she managed to act at all. Both Bullock and Clooney undoubtedly suffered for their art during the making of Gravity but they did not suffer in vain - Gravity is a masterpiece and one of my favourite films. Gravity is one of the few films that I would recommend watching in 3D and on the biggest screen that you can find (so wish I had seen it on an IMAX screen). However, I have watched it at home three times now and still enjoy it - it feels 3D even on a 2D screen. I loved the moment after I watched Gravity with my son and he said that he had really enjoyed the film but felt that they had stolen a key scene (involving a fire extinguisher) from Wall-E! Brilliant - and totally what that scene reminded me of too! 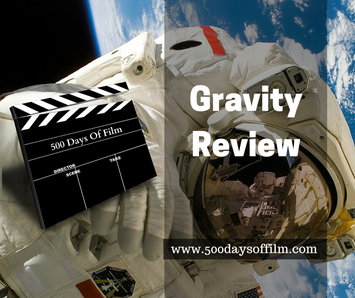 Do you love Gravity as much as me or do you feel this film is just a gimmick? Whatever your view, let me know in the comments section below!